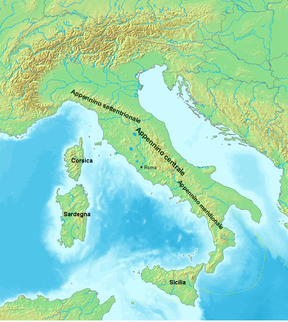 The Apennines or Apennine Mountains (/ˈæpənaɪn/; Greek: Απέννινα Όρη, Laitin: Appenninus or Apenninus Mons—a singular uised in the plural;[note 1] Italian: Appennini) are a muntain range consistin o parallel smawer chains extendin c. 1,200 km (750 mi) alang the lenth o peninsular Italy. In the northwast thay join wi the Ligurian Alps at Altare. In the soothwast thay end at Reggio di Calabria, the coastal ceety at the tip o the peninsula. Syne aboot 2000 the Meenistry o the Environment o Italy, follaeing the recommendations o the Apennines Pairk o Europe Project, haes been definin the Apennines Seestem tae include the muntains o north Sicily, for a tot distance o 1,500 kilometres (930 mi). The seestem forms an arc enclosin the east side o the Ligurian an Tyrrhenian Seas. ↑ Apenninus haes the furm o an adjective, which would be segmentit Apenn-inus, eften uised wi nouns such as mons (muntain) or Greek oros (orogeny) but juist as eften uised alane as a noun. The auncient Greeks an Romans typically but nae always uised "muntain" in the singular tae mean ane or a range; thus, "the Apennine muntain" refers tae the entire chain an is translatit "the Apennine muntains". The endin can vary an aa bi gender dependin on the noun modified. The Italian singular refers tae ane o the constituent chains rather nor tae a single muntain an the Italian plural refers tae multiple chains rather nor tae multiple muntains. ↑ Lewis, Charlton T.; Short, Charles (1879). "Apenninus". A Latin Dictionary. Oxford; Medford: Clarendon Press; Perseus Digital Library. This page wis last eeditit on 18 Januar 2019, at 02:26.